You’ll recall that I mentioned that Beijing’s metro is hardly an expedient way to travel (though I am sure it is better than dealing with street traffic), especially when transferring lines is involved. Despite having spent 5 days in the city, we somehow decided it was a good idea to get breakfast before we left, even though the abysmally turn around time in the kitchen meant that by the time we had bolted down our food and out the door, we found ourselves with only 45 minutes to reach Beijing Central. But we only had to ride 4 stops, so we convinced ourselves that we would be fine and have plenty of time to catch our train. Unfortunately, although we are traveling light, our packs slowed our progress to the nearest metro stop, where we then had to have our luggage screened before we could enter the station. Somehow we wedged ourselves onto an already overflowing subway car, but when we alighted at our transfer station, got stuck behind a man who stood for a good minute or two after getting off the train, refusing to budge and making it impossible for any of the other passengers behind him to continue on their way. This also happened to be one of the interchanges where it takes five minutes to travel between lines at the best of times, and our travel time had now been upped to seven minutes. 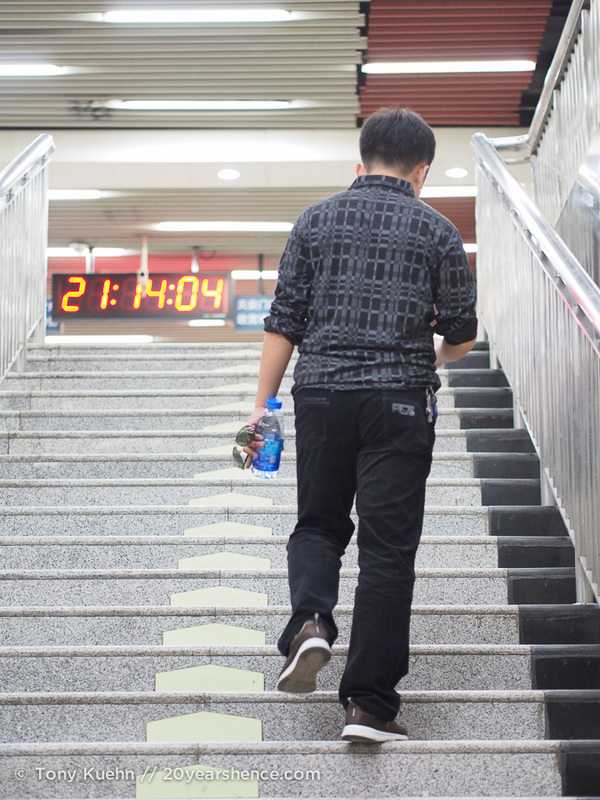 Although we really didn’t have any time to waste, we for some reason had to have our bags scanned once more upon leaving the metro, and as we raced across the plaza to Beijing Central, we had about 10 minutes before our train was scheduled to depart. And of course there was a queue just to get into the station, and of course we also had to subject our bags to another security check before we could enter the train station. What they were looking for in these screenings, I cannot tell you as most people’s “luggage” consisted of lumpy burlap sacks and old rice bags filled with god knows what and we know for a fact that people bring knives on these trains without issue. Regardless, by the time we actually set foot in the station, we had 3 minutes before our train left, and we dashed about madly trying to find out what platform it was leaving from. None of the departure boards provided any clues, and after shoving our tickets at several railway employees we were directed to the correct place only to watch in horror as our train pulled out of the station, leaving us behind in Beijing. There are not enough curse words and pejoratives in the English language to express how dismayed and furious I was at this turn of events, though I certainly used as many as I could think of as creatively as I could for about five minutes before I was capable of any rational thought. I am also sorry to admit that for having been the one who had decided to order breakfast in the first place, Tony was the unfortunate target of a good deal of my wrath. I was desperate to get the hell out of Beijing, but then again, so was he; needless to say, those were definitely not my finest five minutes. Post-venting, we trudged over to the information desk and tried to explain our predicament: we had tickets to a train that had just left without us on it. Praying that we might be able to exchange our tickets for a later train, rather than having to buy completely new ones, we were directed to the ticket hall. I thought being sick with the flu while staying in a 9-bed dorm in Hong Kong was bad. I thought the crowds at the Forbidden City were worse. The ticket hall at Beijing Central makes both of those look downright pleasant. There were at least 50 different windows, each with gnarled lines 30 to 40 people deep radiating out from them, while scores more milled about with no obvious purpose. Seeing a sign above one window with the magical words of “English Speaker” above it, we braced ourselves against the roiling crowds for close to one hour, only to then find that tickets could not be exchanged at that window. Instead, we would have to wait in yet another line, where thankfully English was spoken, and even more thankfully, our tickets could be changed for a train leaving from Beijing West later that afternoon. But what does any of this have to do with $24 pancakes? There were now only hard seats available for the 8-hour journey, whereas our original tickets had been for the more desirable hard sleepers, and were consequently more expensive. The price difference amounted to $20USD, and of course that was not refunded. Add that to the original $4USD we paid for that fateful plate of pancakes, and you see how that meal wound up costing us, figuratively and literally, so very much. It was hard to deal with just how royally we had screwed ourselves over, but at the end of the day, we made it out of Beijing, which was ultimately more important than any amount of money… Some things, you really can’t put a price tag on! Oh, there’s nothing worse than that horrible feeling when you’ve JUST missed a plane, train or bus. Glad you guys made it out of there eventually! I think this is the first time I have ever missed anything critical/relatively expensive like this, so it was definitely a terrible first… Wouldn’t have been nearly so bad if we hadn’t been hating Beijing so much, but it was really a pain to see our exit plan head out of the station without us! Oh to watch it pull off the platform and not be on it. Sucky! Yes, expensive pancakes indeed! Gillian @OneGiantStep recently posted..Should We Have Skipped The JR Rail Pass? Yup… it was like a scene out of a horror film! I rued those pancakes for the next 6 hours! I read, “we were directed to ticket hell” instead of ticket hall. Looks like that wasn’t too far off. Ugh, I’m sorry. That sounds like a bad day. I felt anxious just reading this! It sounds like China is a pretty frustrating place to travel – I hate slow walkers for a start, we get loads of those in London. For what it’s worth I can relate to taking out frustrations on your partner, I’m definitely guilty of that on occasion! You have no idea how frustrating it is trying to get around China, both within cities and between them. SUCH A PAIN. We’ll write more on it later, but we were not fans, and our travel plans got screwed up more than once because of the transportation (or lack thereof). What a brutal story. Regretting overspending, and missing transportation are by far my biggest travel stresses/fears. I hope things improved once you finally got out of Beijing. Glad you made it out in the end. Phew! I at least pride myself for not being quite so foolish to pay $24 up front for those pancakes! Though I wouldn’t be surprised if SOMEWHERE out there, there was a hostel charging close to that. Surprisingly, food at hostels in China was generally of good quality and not marked up very much at all!